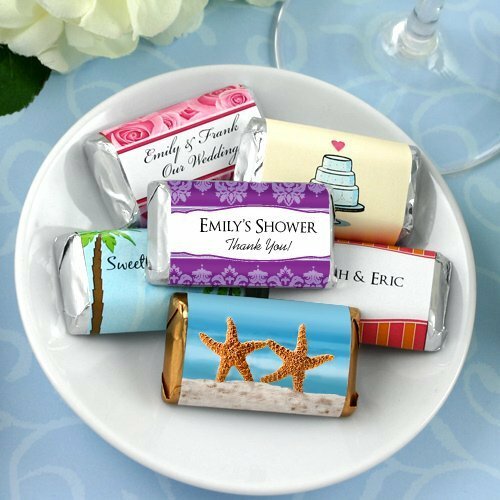 Share a sweet treat with your guests using these Hershey wedding favors! We have a wrapper design to suit every theme and style! This assortment of Hershey chocolate miniature bars are a nice favor to put on your reception tables, or to include in favor bags as a take-home gift. To add a personal touch, the wrapper includes 3 lines of text. Each individual candy bar arrives wrapped with your personalized design. NOTE: Text placement and font varies per design. See your chosen design for example text. Hershey Miniatures candy bar assortment includes Milk Chocolate, Krackel, Special Dark, and Mr. Goodbar. Wrappers are available with or without candy bars. Hershey Miniature Bars Info: The bars come in the standard Hershey miniature assortment of Milk Chocolate, Krackel, Special Dark, and Mr. Goodbar. Please note that Special Dark Miniatures have gold foil ends and the Mr. Goodbar contains peanuts (in case of allergies). Your bars will arrive wrapped in your personalized labels. Individual bars weigh about .03 lbs and measure 1.75" wide by 1" tall. They have a shelf life of 1 year and are kosher. Can I order just the milk chocolate mini bars instead of the assortment? The Personalized Wedding Mini Hershey Chocolate Bars Favors are only sold as an assortment. The assortment includes Milk Chocolate, Krackel, Special Dark, and Mr. Goodbar. Also, only the Special Dark Miniatures have gold foil ends, the others are in silver. I have a question about the Hershey Kisses. When ordered, is the personalized sticker already on the candy? 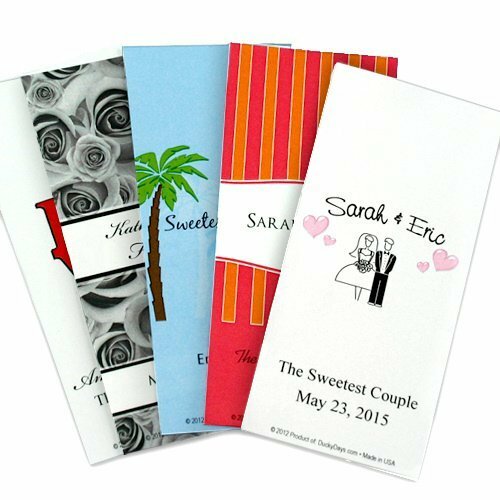 Yes, the Personalized Wedding Mini Hershey Chocolate Bars Favors will arrive already wrapped with your personalized design.